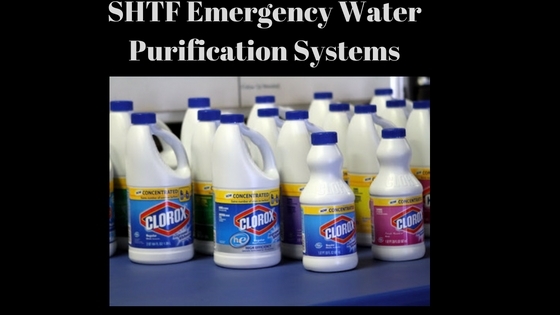 Boiling water and adding chlorine (household bleach, such as Regular Clorox) to water are the two most common emergency water purification systems. bacteria and other harmful microorganisms. For 5,000 feet below sea level, boil for around five to seven minutes. Please note, these times are minimum times. As a general rule the longer you can boil the better. The boiled water will likely taste rather flat. You can fix this by aerating the water by pouring it, from one container to another, several times. Common household bleach (like Clorox) contains a chlorine compound that will disinfect water. The bleach to water ratio for sanitizing requires eight to 16 drops of bleach per each gallon of water. For mostly clean water, eight drops of bleach is sufficient and for murky or cloudy water 16 drops will work. Thoroughly mix the water, cover it for at least a half hour. If the water has a slight chlorine smell, then the water should be safe to drink. If the water doesn’t smell like chlorine, you’ll need to double the initial drops and then wait for an additional 15 minutes to test the water again. If there is too strong of a chlorine taste, you’ll need to air the water out. Airing the water is done by repeatedly pouring water from one container to another container until the water tastes better. Also, a small pinch of salt for each quart of water boiled helps improve the water taste. Wait for the particles to settle before doing anything. If applicable, filter out any particles in the water with cloth, paper towels or even coffee filters. You’ll want the water to have a faint bleach smell if it does not add more bleach and wait for another 15 minutes and then test for the bleach smell. Water should be safe to go when you smell the bleach. As part of disaster prep, you should keep an eyedropper taped to the bleach bottle. Use standard, non-scented, bleach. Make sure the bleach is fresh as the bleach has a shelf life of only around three months. You should double the recommended bleach if the water is cloudy or exceptionally dirty. If the SHTF, proper sanitization is essential. This means that you need to have methods to properly clean your pots, pans, dishes and other kitchen utensils. However, it is next to impossible to clean your kitchen utensils by way of steaming hot water. So, you’ll need to use bleach for sanitizing the kitchen. For kitchen sanitation, all you need is to mix one tablespoon of bleach for every water gallon. You then wash, rinse, and soak the dishes in the bleach/water mixture for at least two minutes. First of all, you should have at the minimum 72 hours worth of drinking water in storage. But, if the SHTF, boiling water, and bleach are the two most reliable emergency water purification systems. So, you need to make sure that you are stocked up on a fresh supply of bleach.